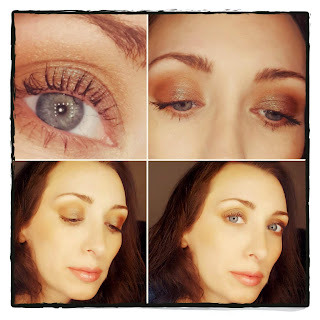 This is my final post in the Fall 2018 Eyeshadow Color Series. While I realize duochrome is not a "color," it is a type of eyeshadow that I love to wear this time of year. Duochrome eyeshadows are great for a one and done eye look because it looks like two different colors depending on how the light hits it. Pretty much every Fall for as far back as I can remember, a duochrome shade makes it into my top 5 of the season. This Fall, I am using one of the more popular duochrome shadows available, a deep red-brown or eggplant with a pearled teal flip. 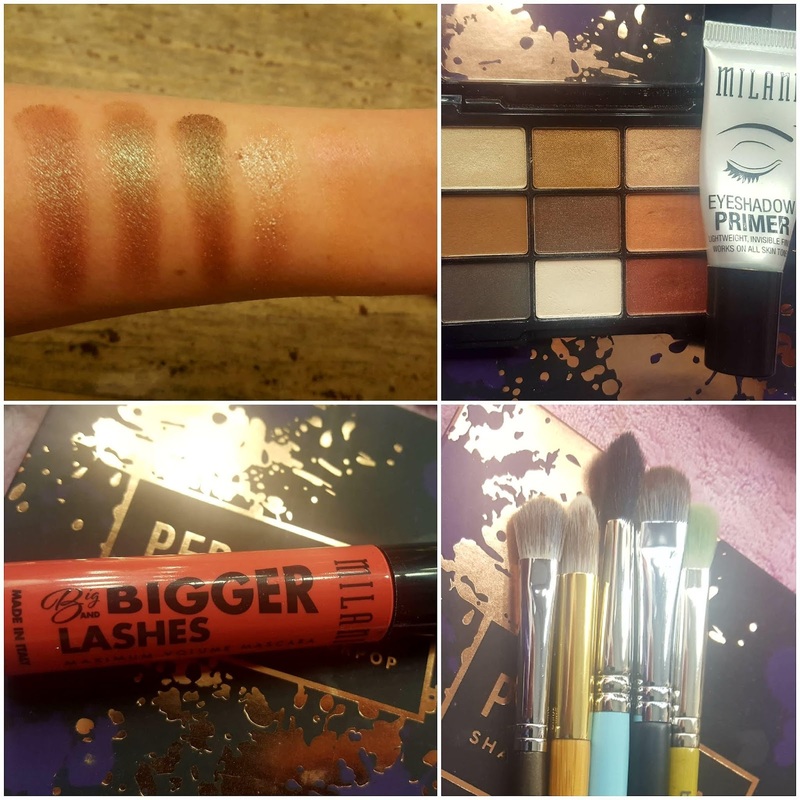 Many brands make a version of this eyeshadow, so it is easy to find at a variety of price points. It sounds weird that a deep purple eyeshadow can also look greenish teal, but that is exactly why I love duochromes. They provide an unexpected element to your look. 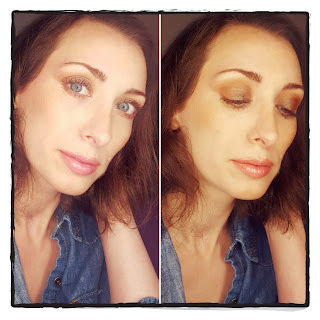 While I created an entire makeup look, the focus of this series is all about the eyeshadow. Pair this look with any lip, and blush combo that you prefer. However, when dealing with an eyeshadow as interesting as a duochrome, I often like to keep the lips light or neutral so the eyes remain the focus. 1. Eye Base: eye primer, white cream base (such as NYX jumbo pencil in milk), or black base such as a black cream liner. 2. Matte powder shadow or face powder: you will need something the same color as your skin or slightly lighter if you want more of a highlight effect. 3. Transition shade: warm matte brown, or vibrant matte orange (depending on your skin tone) for your crease. 4. Duochrome shadow: chose your favorite. Some duochromes from my collection that I enjoy are: Sassy from the Perception Eyeshadow Palette (Shayla x ColourPop), Fireball (best over a black base), Omen or Lounge from Urban Decay, Glass Bull (also great over a dark base) from ColourPop, or the red/brown with teal shift from the Wet n Wild Comfort Zone palette. 5. Black Mascara or false lashes & lash glue: I used my favorite mascara, Milani Big and Bigger Lashes. However, use whatever mascara or false lashes your normally do when wearing a more dramatic eye look. I did not use any eyeliner for this makeup, so it is important that the lashes are defined. Below are swatches of the duochrome eyeshadows that I mentioned in number 4. It is kind of difficult to photograph the complexity of these, but in person you really see the color shift depending on the light. The duochrome mentioned above from the Wet n Wild Comfort Zone palette is a great dupe for Urban Decay's Lounge. As you can see from the picture below, it is slightly different (the base leans more brown than red), but they are quite similar. In fact, Sassy is very similar as well, but the base is more of a deep purple, than a red-brown. Glass Bull is a lightened version of this, which is why I often use it over a darker eyeshadow. Fireball is completely different from the others in terms of color profile, but it is still a duochrome. I wanted to provide at least one eyeshadow that was completely different from the others. Fireball is a light color, and peach and pink are colors so close to one another, that the duochrome effect does not provide as much contrast. 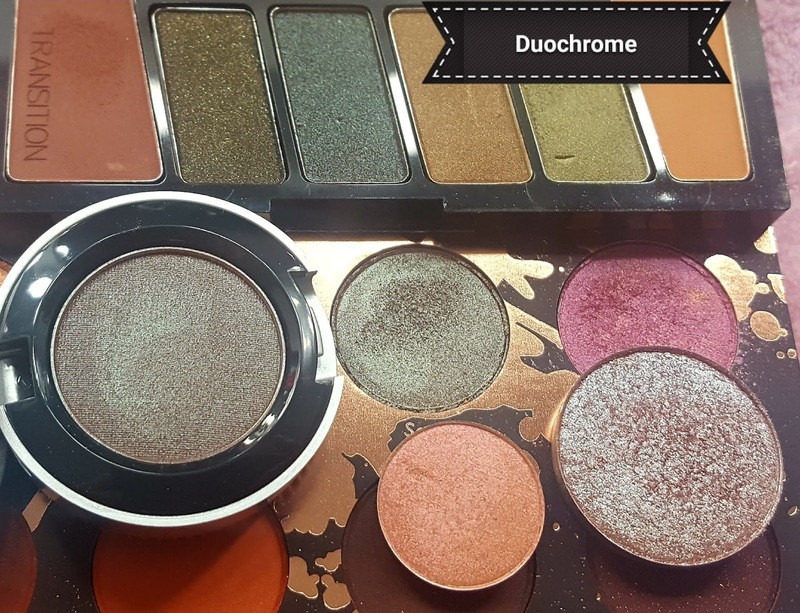 This could be a good choice for someone looking to try a duochrome for the first time who does not want the shift in color to bee as dramatic. Urban Decay offers a large selection of duochrome eyeshadow color combinations, so I recommend their brand as a good place to start if you are new to this type of eyeshadow. ColourPop also has a nice selection of options, and they are a very affordable price point! I used my regular Milani Eyeshadow Primer, but duochromes level of interest can be intensified by choosing a white or black base underneath. 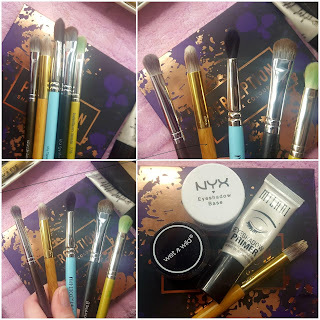 Below are the five brushes that I used to complete my eyeshadow look. These are from a variety of brands, and as always my brushes are all made out of synthetic bristles. While I usually apply my foundation first, I recommend doing the eyes first for this look. The metallic duochrome shadows I mentioned above all can have a little bit of fallout, so cleanup is easier if you do your foundation after. 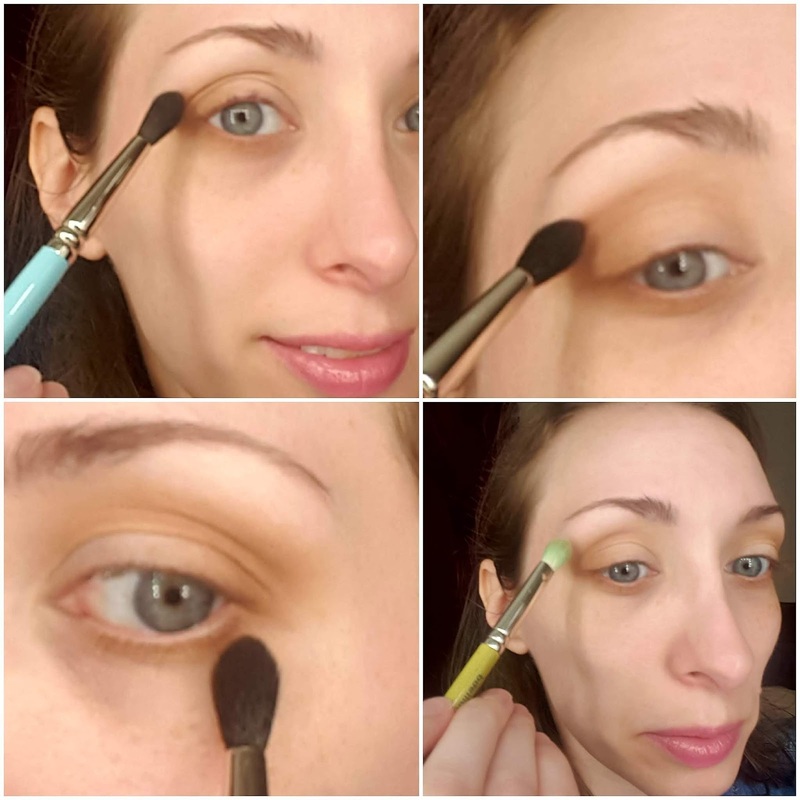 To start, I applied my eyeshadow base (Milani Eyeshadow Primer) with a Tarte concealer brush. No matter which color base you apply, you will only want a thin layer of product to prevent creasing. The primer was applied to both my top and bottom eyelid, taking it up to just below my brow. Next, I used a standard fluffy eyeshadow brush to pick up a matte white powder eyeshadow. This was applied from lash line to just under my eyebrow, as well as the inner corner of my eye. 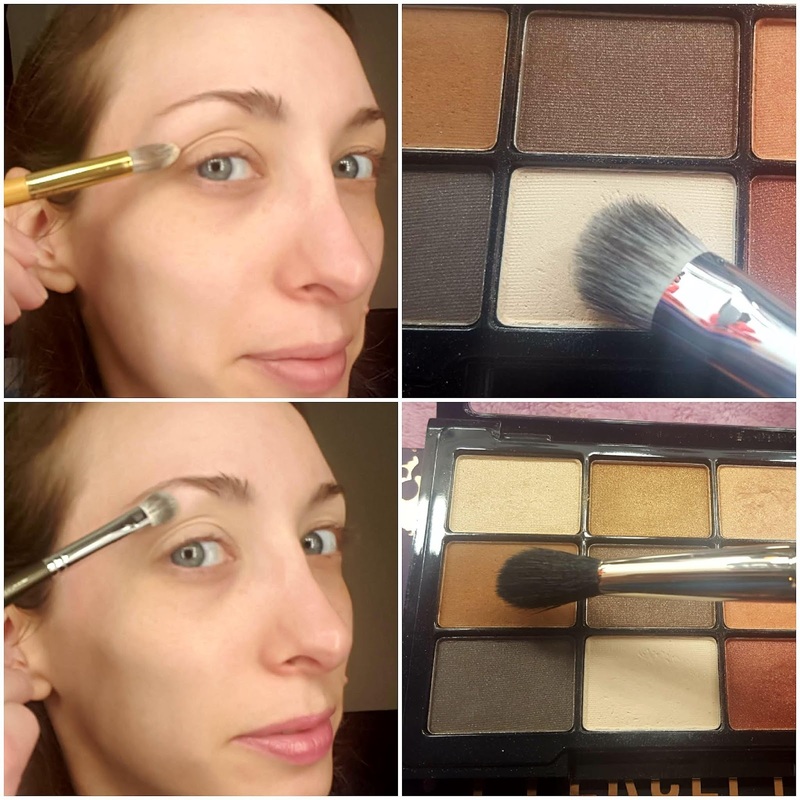 I chose white for a brightening effect, using it to set my eyeshadow primer and serve as a base making it easier to blend out the other shadows that I used. On a crease brush, pick up your transition color. I used a matte warm brown eyeshadow from NYX. Blend your transition shade through the crease of the eye. Apply a bit to the outer corner of the eye, and along the lower lash line using the same brush. Work in light layers, adding more until you reach the desired intensity. Next, take a clean blending brush and blend out any harsh edges. Now for the main event! On a flat shader brush, pick up some of your duochrome eyeshadow. I used Sassy from the Perception palette. Begin by lightly patting on some of the color to the inner portion of your eye lid, then move your brush in a light swiping motion to blend the color across the eyelid. Stop when you reach the transition color that you previously applied to the outer corner of your eye. You want the duochrome and transition color to blend into one another seamlessly, so switch between your blending brush and flat shader brush as needed to blend the colors together. You may need some more of your transition shade to deepen the outer crease. Some metallic and duochrome eyeshadows perform better when applied with a damp brush. The color that I used, Sassy, is very pigmented and smooth. I applied the shadow using a dry brush, because I was able to get the intensity I desired without any extra steps. 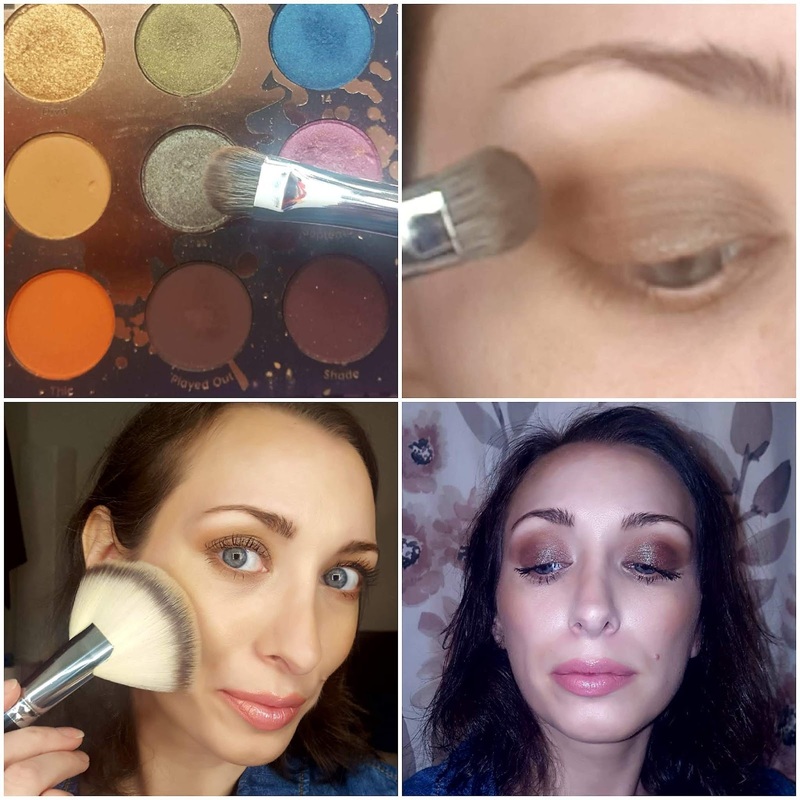 Take a look at your eyeshadow, and blend any harsh edges. If you need to touch up the highlight or crease color, do so at this point. Once the powder eyeshadow looks the way you want it to, go ahead and apply several coats of black mascara to the top and bottom lashes, or false eyelashes if you are wearing them. This duochrome eyeshadow look is complete! 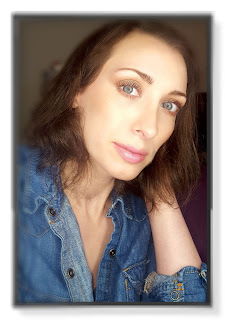 I did use a large synthetic fan brush from Crown Brush (affiliate link. Use code LIZACHUNG for 10% off regularly priced items) to bronze up my face and neck, as well as apply a touch of blush. I wanted the eyes to be the primary focus, but darker eyeshadow can make me look quite pale if I do not use the right products on my face. I chose a matte bronzer, and a pinky-peach blush with just a hint of shimmer. As previously mentioned, I kept the lips light, with a peach lip pencil and a touch of sheer sparkly gloss in the center. I photographed my makeup in different light, with and without flash to try and capture the different colors reflected in the Sassy eyeshadow. Since I wore this look during the day, I did not apply the duochrome eyeshadow to the lower lash line. I kept that matte with the warm brown transition shade. However, if you want to wear something like this for the evening, applying more of your duochrome eyeshadow, and taking it along the lower lash line will have a lovely dramatic impact. My goal was to create a mostly neutral look, with a hint of the duochrome shadow. This look is quite wearable, but will still keep people guessing what color your eyeshadow is! I hope you enjoyed my Fall 2018 Eyeshadow Color Series. Which post in this series was your favorite? If you happen to try any of these looks on yourself, please send me a picture on Twitter @MakeupMatters1. I would love to see you recreate my looks. Interacting with my readers makes me so happy. 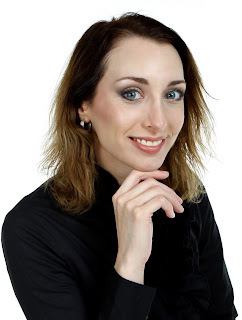 YOU are the reason I write this blog! I want to share the techniques that I have learned over the years with you, and hear any ideas and product recommendations from you! *All of the products in this post were purchased by me. I do not get paid to write reviews. I am an affiliate with Crown Brush. If you chose to purchase makeup brushes through this link: Crown Brush I will earn a small commission. This helps to support the site, and bring you more content that you love. You can use my discount code: LIZACHUNG for 10% off regularly priced items when shopping through my affiliate link. I have used Crown Brush makeup brushes for many years, and find them to be an affordable brand that has a lovely selection of quality synthetic bristle brushes. Crown Brush clearly displays the type of bristles in each brush on their website so please check to make sure that you are purchasing exactly what you want. For a complimentary brush assessment, and personalized brush recommendation, please send me a message via Twitter @MakeupMatters1. If you would like to book an appointment for a makeup application, lesson or professional organization plan, I can be reached at makeupmatters3@gmail.com (for professional inquiries only please).